One of New York City's newest public schools got its name after a Lebanese poet who promoted peace and published his most famous work while living in the city, but the school has faced little peace. With a little more than a week remaining until the academic year starts, the school - announced in February as New York City's first school to offer instruction in Arabic and on Arab culture - already has had to move once and has its second principal, both because of protests. 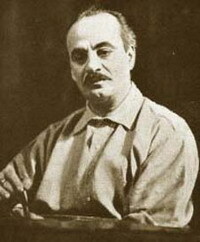 Critics have attacked the school, named for the Lebanese Christian poet Khalil Gibran, as a potential radical Islam training ground. Supporters have been taken aback by the controversy. "In fact it is a regular public school, the only difference is they're going to use Arabic as a medium," said Shamsi Ali, imam at the Islamic Cultural Center in Manhattan, who served on an interfaith advisory council for the school. "It is absolutely not a religious school and no one has any intention of teaching religion." The city Department of Education announced the school as one of 40 new schools opening this fall. Khalil Gibran is starting with sixth-graders and will expand with one additional class every year to end up with 500 to 600 students in grades 6-12. It joins a number of small public schools in the city that are themed, covering areas from the arts to social justice to Chinese language. The school was originally going to take space in an elementary school in Brooklyn. Parents at the school objected for a number of reasons, including whether there would be enough space and whether the ideological controversy would create a security risk. The Department of Education gave in and moved the school to a building elsewhere in Brooklyn that houses a high school and middle school. Khalil Gibran's original principal, Debbie Almontaser, left earlier this month after criticism for her failure to condemn the use of the highly charged word "intifada," an Arabic term for the Palestinian uprising against Israel, on T-shirts. She was replaced by acting interim principal Danielle Salzberg, a Jewish woman who does not speak Arabic. That uproar started when an article connected Almontaser to Arab Women Active in Art and Media, a group that produced shirts imprinted with the words "Intifada NYC." The group used office space shared by an organization that counts Almontaser among its board members. Almontaser did not respond to an e-mail request for comment. The Department of Education declined to make Salzberg or any teachers at the school available for comment, but has reiterated its support for the school. Mayor Michael Bloomberg has added his voice to the support of Salzberg and the school. The school's opponents include an organization called "Stop the Madrassa," or religious school, that calls the school "badly managed and inflammatory." Members say the city has not been upfront about details of the curriculum and the content of the textbooks, and they believe the school will have a hard time keeping Islam out of the classroom. Salzberg has met with some of the 44 students who have enrolled so far at the school, most of them not Arabic-speakers or even Arab. At least one parent was unfazed by the controversy. Yolanda Exis said she was just glad her 12-year-old son, Allan Aluder, could take advantage of being in a smaller school. "I think the size of the classroom is most important," she said. Her son says: "I just want to learn the language."